15th February 2015 – The PACE trio of Matthew Centrowitz (USA), Shannon Rowbury (USA) and Dina Asher-Smith (GBR) remain undefeated in 2015 after another successful weekend of competition. Centrowitz and Rowbury both put their records on the line in the historic Wannamaker miles at the Millrose Games in New York. In a stacked mens race Matthew went toe to toe with New Zealand’s Nick Willis over the final 100m and was able to finish the stronger to take victory in 3:51.55, the fastest time in the world this year. Shannon took a more comfortable victory in the womens event but didn’t work any less hard as she and Jordan Hasay (USA) really stretched the field from halfway on. Shannon had been looking to chase the American indoor mile record but some erratic early pacing put pay to that. However, she still took the victory in 4:24.32. Jordan finished third in 4:28.27 and completing the PACE representation in the race was Mary Cain (USA) who took 8th. Dina was in action at the British Indoor Championships, an event which also doubled as the trials for next months European Championships. 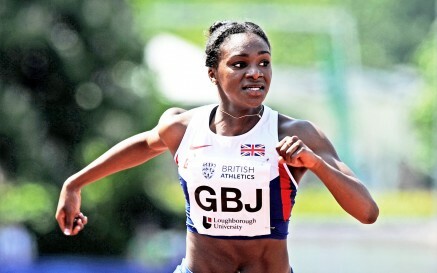 She was dominant throughout all three rounds of her 60m event and comfortably won the final in 7.15 seconds. At the same championships Tom Lancashire (GBR) took third in the 3000m. On the roads Mike Kigen (KEN) continued his recent good form with a fifth place finish in the prestigious RAK Half Marathon. Leading the field for large parts of the race Mike just didn’t have the speed over the final 250m but still ran a solid 60:14 to show his Spring marathon preparations are going well. Moses Kipsiro (UGA) booked his place on the Ugandan team for the World Cross Country Championships by taking second place in their trial race in Kampala. Opening their outdoor campaigns at the Camperdown Classic in Jamaica, Commonwealth Champion Kemar Bailey-Cole and Ristananna Tracey both won their respective 400m heats.